Together with French utility EDF, Renault wants so develop solutions in the field of smart charging and expand the concept of “smart islands” to non-interconnected French territories, among others. This partnership comes as EDF’s president Jean-Bernard Levy announced the plan to operate 75,000 charging stations in Europe by 2022 as it aims for a 30% market share in its main markets of France, Belgium, Italy and Great Britain. A new agreement with Total and Jedlix sees the launch of a mobile app – the Z.E. Smart Charge app – in France in the first half of 2019. It shall be designed to optimise the charging of electric cars regarding the use of renewable energies and low electricity prices. Among others, the app financially rewards vehicle users the more flexible they are. And third, Renault is also working with Enel X, subsidiary of Italien utility Enel, to exploit synergies and develop individual charging solutions. According to the French carmaker, the cooperation will initially focus on smart charging through Enel X’s JuiceNet platform in the form of a pilot study in Italy prior to release nationwide and other countries. The partnership shall also help to further expand charging infrastructure under EU projects like EVA+ and to facilitate access to existing charging points thanks to digital apps such as ZE Pass Renault. 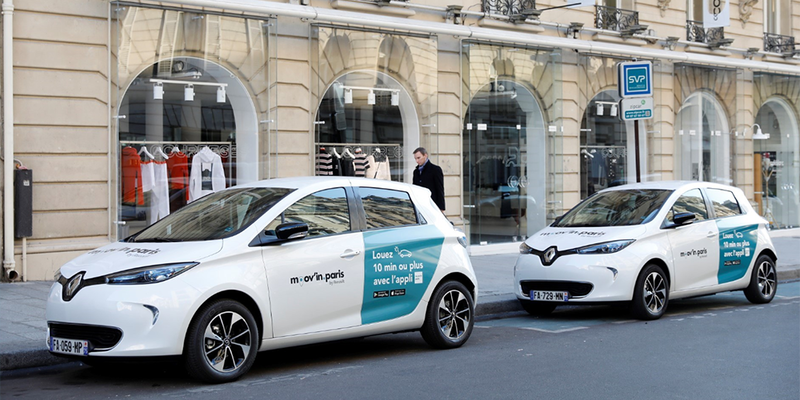 Apart from that, Renault and ADA have officially kicked off their new EV sharing service Moov’in in Paris. The free-floating EV sharing service started with 100 Zoe. Until the end of October, the fleet shall grow to 200 Zoe and 20 Twizy, reaching 500 vehicles by the end of the year. Since the release of the according mobile app on September 28, more than 5,000 users have downloaded, according to Renault.